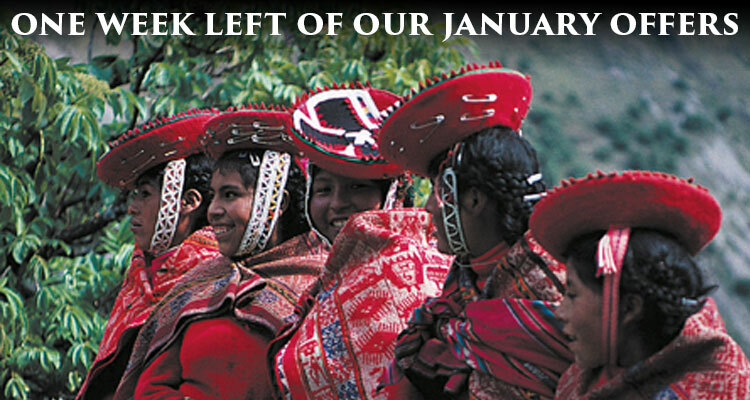 Make use of our January sales offers - one week remaining! If you still haven't booked a holiday for 2019, you have one week left to take full advantage of our best-ever January sales offers. Ending on February 2nd, there are two offers to choose from. Secure your holiday for a low deposit of just £199pp or pay in full at the time of booking and save up to £200pp. 1) Experience a panoramic exploration of Roman and Gallic life in the magnificent south of France. Join expert Guide Lecturer John Shepherd on this 7-day tour, which will take you along the route forged by Romans, offering you private access to the Roman site of Albintimilium and the chance to admire incredibly well-preserved ancient monuments. 2) Join us on a tour of China that will take you beyond the Great Wall. In the company of Dr. Kim Hunter Gordon, a historian of late Imperial and modern China, travel around the country taking in a range of diverse and incredible sites. From the underground army of the Terracotta Warriors and the outstanding Longmen Grottoes (pictured above), to the Garden of the Humble Administrator and the Shanghai Propaganda Poster Art Centre, this is an all-encompassing experience. 3) Embark upon the adventure of a lifetime to Chile and Easter Island alongside Dr. Paul Bahn, the world's leading rock art expert. Discover colonial Santiago, tour an array of captivating museums and pay an unforgettable visit to Easter Island, where a face-to-face meeting with the iconic Moai statues awaits. There's even the chance to explore the quarry at Rano Raraku, where a number of unfinished Moai are still standing in situ. 4) Stand before ancient rock art in the Namibian wilds this year. This tour has limited availability, so you need to act fast to secure your place! Experience game drives in the amazing Etosha National Park, visit the fantastic AfriCat Foundation in Okonjima and find out more about the worthwhile work they do, and explore sites that are home to incomparable prehistoric rock art. 5) Travel between the cities of the Silk Road in Uzbekistan. This unique tour offers you the chance to visit the UNESCO-listed Samarkand, Shahrisabz and Bukhara. You'll also be taken to the ornate palaces within the city of Khiva, there will be a visit to the magnificent Bibi-Khanym Mosque, and you can take in avant-garde art at the renowned Savitsky Art Museum. 6) Discover Peru and its enigmatic Nazca Lines in the company of expert guide, David Drew. There are a few last remaining spaces on this fantastic tour, which will take you from the legendary trail of Machu Picchu to the skies above the Nazca Lines, which you can admire from a plane. You will also discover the Inca heartland in Cuzco, explore the biodiversity of Peru and observe endemic wildlife. 7) From the ruins of Carthage to the magnificent Roman towns and monuments of Tunisia, we discover it all on this Punic Wars tour. See the amphitheatre at El Djem, the remote site of Dougga and the phenomenal mosaics at both the Bardo and Sousse Museums. This trip will allow you to experience unrivalled Classical archaeology in the company of expert Tony O'Connor. 8) Brittany offers a prehistoric landscape filled with some of the greatest Megalithic monuments in the world, from standing stones to chambered tombs. Observe passage graves, chambered tombs and polished axes; take a ferry over to the island of Gavr'inis, and lose yourself in the beauty of the French countryside on this 7-day tour. Spend an entire day discovering the sites of Carnac, learn about its Neolithic past and tour great museums along the way. 9) See Sicily in a new light with our expert Guide Lecturer, Oliver Gilkes. The rich and varied history of this sun-soaked island will be revealed through visits to Arab-Norman churches filled with Byzantine and Arabic art, through visits to amazing ancient temples, and by tours of museums where incredible mosaics remain perfectly intact. This tour offers a privileged chance to enjoy private access to the glittering Cappella Palatina, an extravagant chapel erected for the Norman kings decorated with gold leaf and mosaics. 10) Experience the history, culture and stories of gorgeous southern Spain as you follow the scenic route of the Via Augusta. Tour vibrant Seville, Moorish Córdoba and Granada, and pay visits to the iconic Alhambra and the ruined Moorish palace of Medina Azahara. From prehistory to the Renaissance, this tour progresses through the many ages of this fascinating region.